Forget the expensive expressions of love, Valentine&apos;s Day is all about the personal and meaningful touches. Bake your way to your lover&apos;s heart with some of our vintage tins and cutters, using some tried and tested recipes from some of the country&apos;s greatest cooks. 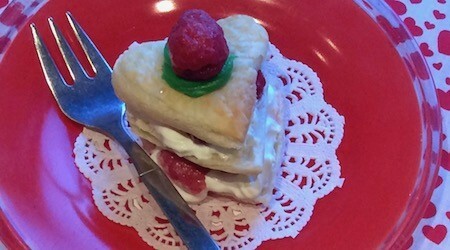 Using heart-shaped pastry cutters you can create some heart cookies. For an added touch, pack them in a vintage Kilner jar and cover with pretty heart fabric tied with red ribbon. A fool-proof recipe comes from Good Housekeeping&apos;s mid century cookery and household management books. It&apos;s one they say can be adapted to many variations. Just drop the lemon peel and add a handful of glace cherries or cranberries for that Valentine look. A simple sponge recipe in a heart-shaped tin can turn into a culinary masterpiece with the addition of fresh cream and strawberry jam with tiny hearts on the top made from Renshaws Poppy Red fondant icing. Use the heart cutter from our Tala Aspic Cutters or Nutbrown Cocktail cutters and if you are feeling particularly creative you could try to fashion a red rose. 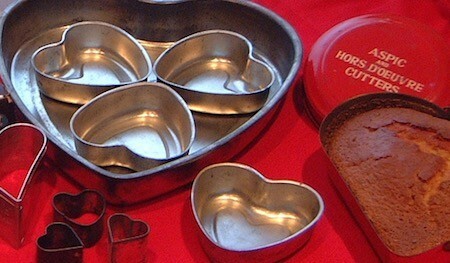 Choose a full size Tala heart tin or an individual one. Treat yourself to a pretty vintage box containing a set of four small ons and one large one. A seventies favourite, a notch or two up from Black Forest gateaux, which will make a wonderful dessert if you choose to dine at home, is a mille-feuilles gateaux: Layers of pastry filled with whipped cream and raspberries. Simply swap the traditional rectangular shape for a heart with one of our individial Tala heart-shaped tins or a large cutter. 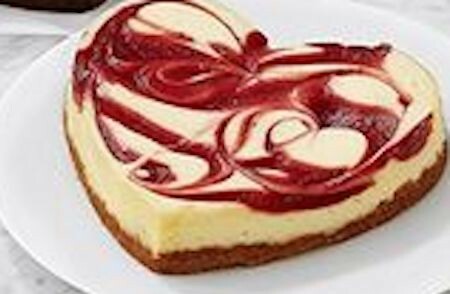 For cheese cake lovers then little heart-shaped raspberry swirl cakes will make a dreamy dessert. Try this recipe from Food to Love. Enjoy a really special evening !